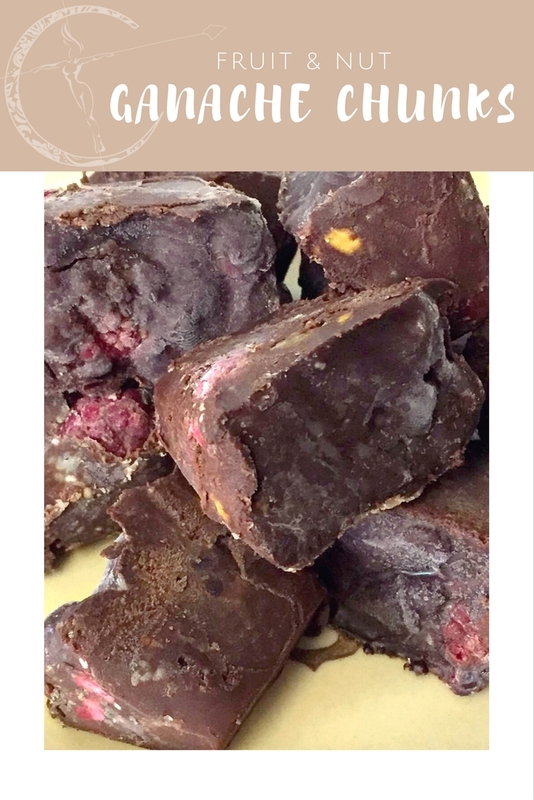 Treat yourself with this no-bake bite of loaded chocolate! There are people who say they don’t like chocolate…. and I am unsure how to connect with those people. I get cravings for chocolate. 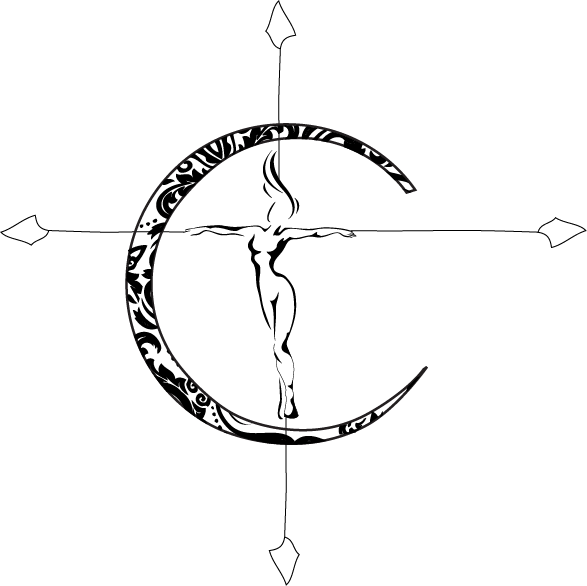 When I get those cravings I would like to satisfy them without feeling guilty about it afterwards. Wishful thinking right? Not so! 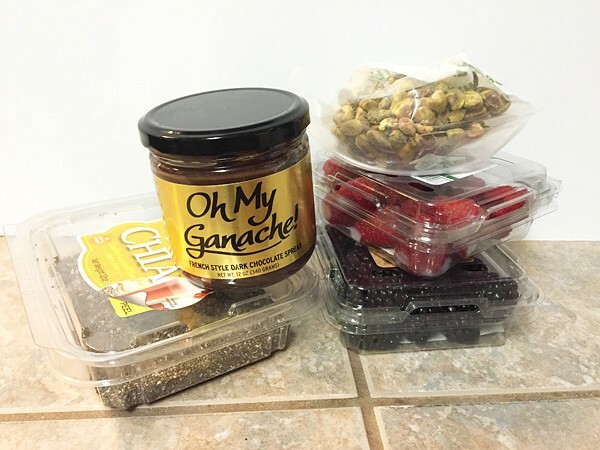 I first met Rick, the founder of Oh My Ganache chocolate, around Valentine’s Day of 2015 when he was promoting his new product. He told me to try his chocolate because it would be the best I had ever tasted. Let me put it this way- we hoarded that first jar of ganache for months because it was precious. 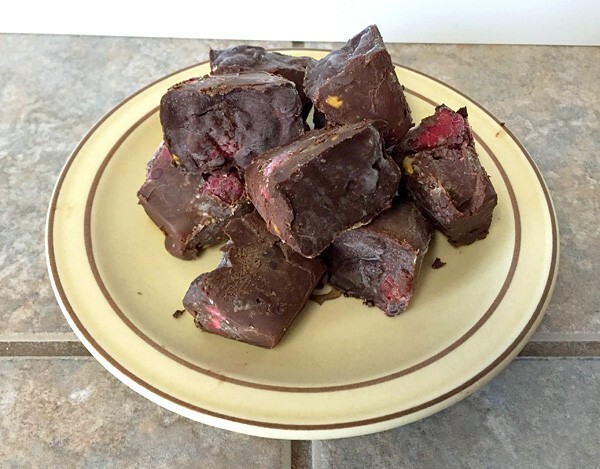 I am sharing this treat recipe I made using his ganache knowing that it is only sold in Texas. I am truly sorry for those who don’t live here, so when you visit- STOCK UP! However, any chocolate spread that is available to you would work for this. The reason I love this particular one, despite the decadent taste, is that it has no high fructose corn syrup or hydrogenated oils. Two tablespoons of Oh My Ganache contains 120 calories and 9 grams of sugar, compared to Nutella which is 200 calories and 21 grams of sugar. If I can have better quality and feel more guilt free about it then yes please! First, I chose the fillings I wanted to combine with the ganache. 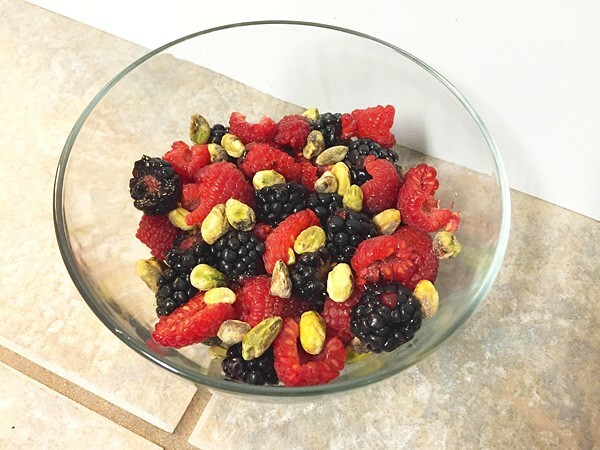 I picked blackberries and raspberries for the fruit, pistachios for the nuts and chia seeds to mix in as well. I cut the blackberries and raspberries in half and combined them with the pistachios. Set the bowl aside for now. 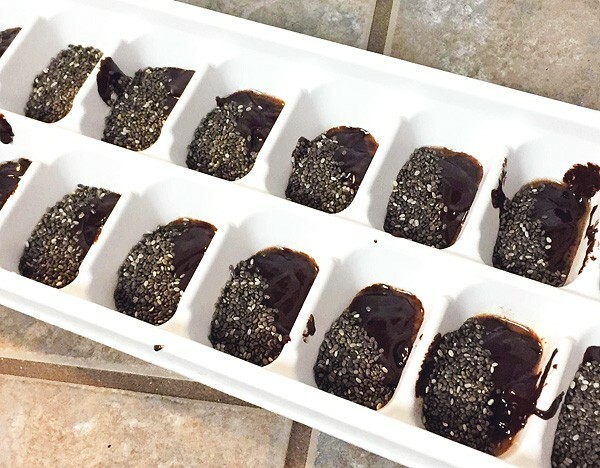 Next I got an empty ice try and filled each cube hole with 1 tbsp of ganache and 1 tsp of chia seeds. Once complete stir it up! I then added a spoonful of the fruit and nut mixture to all. I did have some leftover, which I just snacked on while I finished! I chose to add a little more ganache (maybe 1/2 a tbsp) to the top of each to cover if needed. Otherwise, just stir until all mix-ins are coated and the holes are completely filled. 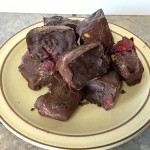 Place in the freezer to harden, then enjoy after a few hours! I recommend storing in the freezer rather than fridge, unless you plan on eating them all quickly. 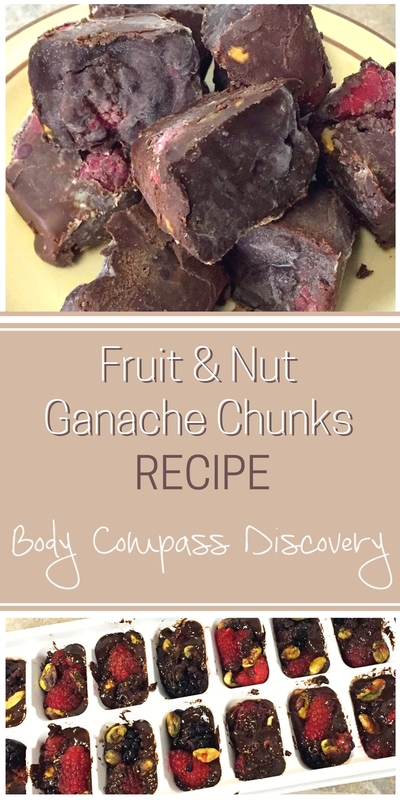 Decadent chocolate chunks filled with fruit, nuts and seeds. Place in the freezer to harden, then enjoy! Freeze for at least 2 hours before serving. 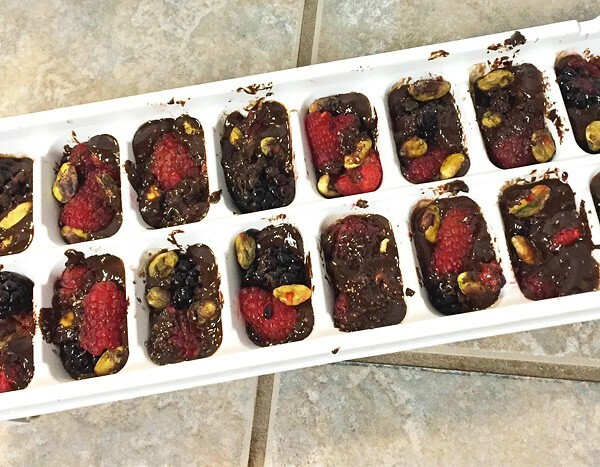 I kept the tray in the freezer overnight (after we taste-tested one of course!) and then took them out in the morning. They did not pop out easily like ice cubes, so I had to cut them out with a butter knife. DO NOT leave these out at room temperature because the ganache will melt very quickly. I am sure these can be stored in the fridge depending on how quickly you plan to go through them, but we kept ours in the freezer in a bag. Not only is Rick extremely personable (and generous- he gave me a free jar when I came to visit the shop after meeting him) but he knows what he’s doing with chocolate. You can find more information about my favorite ganache from the website or check out the Facebook page! These would be a much better option for an ideal bite size piece… plus for some reason they are more desirable in this shape!